Cozy cabins on farmland in a convenient Eastfjords location, easily accessible just off the Ring Road south of Djúpivogur. Bedrooms quiet and comfortable, kitchen equipped with all the necessary amenities. Great window views in the main room. 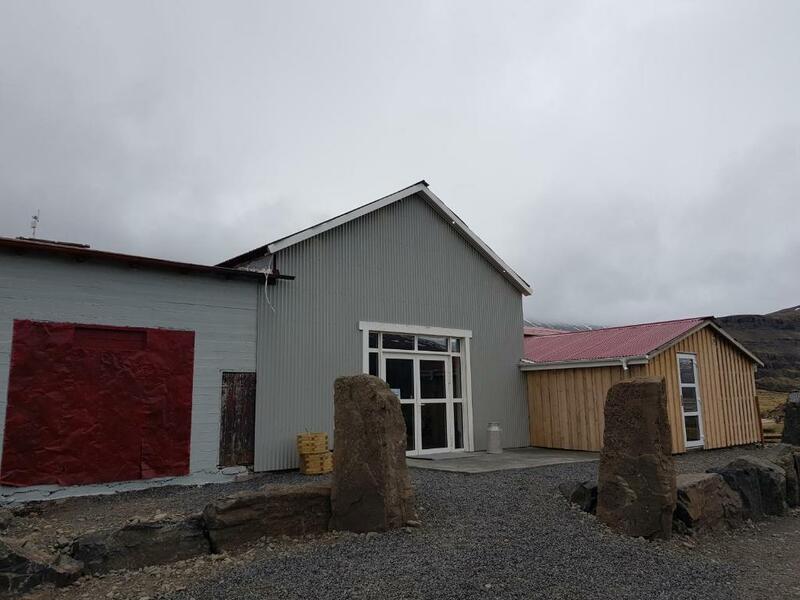 This is a good place for an overnight stop or as a base location for an extended stay in the eastern part of Iceland. Recommended! One of the more special accommodations we had on our trip to Iceland. You basically get our own small wooden house located at the farm. Before arrival you'll get an email telling you everything you need to know - even a small plan which shows the exact location of your hut and the parking space right in front of it. They are left open with the keys lying inside, so check in was simple. Ours had a kitchen with a table and 2 chairs, a living room with a couch, bathroom and bedroom with 2 beds (which one can push together :D). The farm also has it's own restaurant which ought to be very good but was unfortunately closed during our stay. Since you are on a farm you might get visited by some of their animals - we were greeted by Tinni, the farms dog, in the morning. Absolutely beautiful setting, with vast openness surrounding cottage. Very close to stunning mountains. Magnificent waterfalls within walking distance. Dinner was outstanding! New, clean cottages, very functional. Hosts are very friendly and great to talk with. Very knowledgeable host advising guests for travel through highlands during unseasonable weather. Thank you!! Beautiful cottage, location, scenery, very good food. Good small cabin. Wish had more time to explore the amazing surroundings. Easy access off the 1. Comfortable cottages. Beautiful surroundings on the Ring Road. Delicious breakfast. Friendly dog! Cabins are comfortable, and include kitchen facilities. A quiet, scenic place, there's an easy walk to a nice waterfall. Breakfast includes scrambled eggs and bacon made to order. We would like to return someday! The location of the property, it had great views , good restaurant and the food at the restaurant was amazing. Lock in a great price for Bragdavellir Cottages – rated 8.8 by recent guests! Bragdavellir Cottages are located 6.2 mi from Djúpivogur. Free WiFi access is available in all cottages. The accommodations will provide you with a TV and a terrace. There is a full a kitchenette with a microwave and a refrigerator. Featuring a shower, the private bathroom also comes with free toiletries. You can enjoy mountain and river views from the room. At Bragdavellir Cottages you will find barbecue facilities and a terrace. An array of activities can be enjoyed in the surroundings, including fishing and hiking. The property offers free parking. Egilstadir airport is 56 mi away. 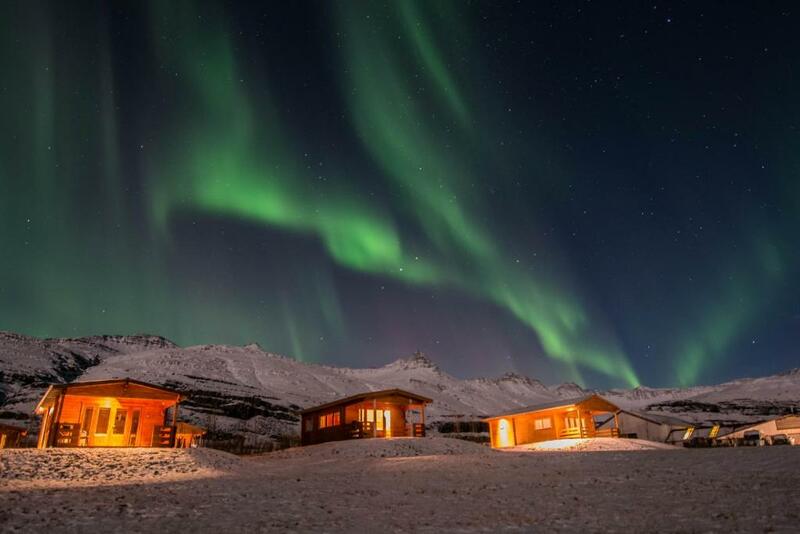 When would you like to stay at Bragdavellir Cottages? This holiday home features a kitchenware, sofa and tea/coffee maker. This holiday home has a DVD player, private entrance and kitchenette. House Rules Bragdavellir Cottages takes special requests – add in the next step! Bragdavellir Cottages accepts these cards and reserves the right to temporarily hold an amount prior to arrival. Location was awesome ! When we arrived there was surrounded with snow, we have lots of fun when make snowman or play snow :) Key collection was convenient, already put on the table in our room. Cottages was cozy and warm, with kitchen, sofa, bedroom and own bathroom which means we had what we needed. Amazing! Cannot say anything else. Thank you!!! There was some problems with heating in main room. Fast and nice reaction for last minute reservation; nice place, real Iceland. Takk fyrir! The restaurant could have been open. We were prepared & used the kitchen, so didn't need to venture out again but the menu of homecooked food sounded good & their own website suggested they were open all year. The location was perfect, easily accessible from route 1 & had great views. We were lucky enough to see the Aurora the night we were here & the host's dog is lovely! Gustur was a smart tidy cabin with all the necessities & some nice touches, we enjoyed borrowing a dvd from reception hut. Didn't meet the host but everything clearly communicated & organised. Smaller patio and bigger living and dining area could be better. Bath cubicle too small. Adequate kitchenware. Comfortable beds including the sofa bed. Gorgeous surrounding views. Whole facility were so nice and awesome. We even saw the Milky Way and the aurora light right in front of the house at night. The sofa bed was uncomfortable. The cottage is pretty little for 4 people. Easy to find. Quite nice place to stay. There is much to say.. everything went good with our stay! Its a really cosy cottage with 2 bedrooms what is really nice when you are traveling with friends! The owners left the indications to a late check in because we didn’t know exactly what hour we will arrive. The house have everything you can need to cook. It have a very good shower with hot water for 4 perfectly! The only point for me its the bed its a little bit soft for my taste.. but nothing impossible to sleep.. Great stay here!!! Definitely We stay here again!